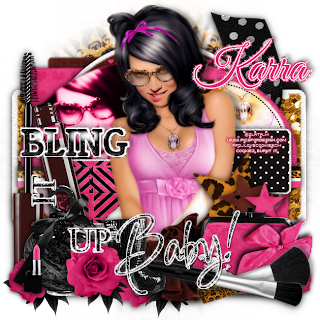 Take a peek at Karra's Kreations "All Dolled Up," currently selling at "ThePimpin' Warehouse" and at "Picsfordesign" For you, I've written a tutorial using All Dolled Up, If you like what I did please go purchase Karra's Kreations kit "All Dolled Up" "Bling IT UP Baby"
Open Bling It Up Baby-template, make sure you re-size it to 650x650. Open the kkpaper10, C/P into the last layer of the template. Open kkpaper10, Copy and paste it over one of the squares of the template, next you will want to grab your magic wand tool, click on the rectangle of the template, press Ctrl+Shift+I on your keyboard, this will allow you to invert. Next click the kkpaper10, and hit your delete key once. Now to make your tube pop out even more C/P your tube over the ovals, the eyes are the key. [[see my signature for example]] and apply a Luminance(L) blend mode to your tube. Now remember to cut the excess parts of your tube off otherwise it will look messy. We just want her face and eyes to pop. So just as you had done with inverting your shapes and deleting the excess paper off your going to apply those same steps to your tube. Open kk_mascara, add your drop shadow, and C/P it on the left side of the template. Now place these elements all around in front of the bottom template. Add your half tube of choice behind the elements.